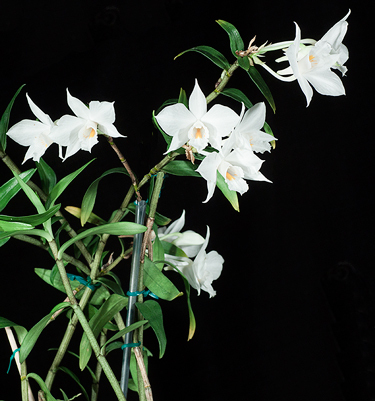 Dendrobium wattii outcross #568 ('5798' x''5805 ') (approximately 25 seedlings per flask). 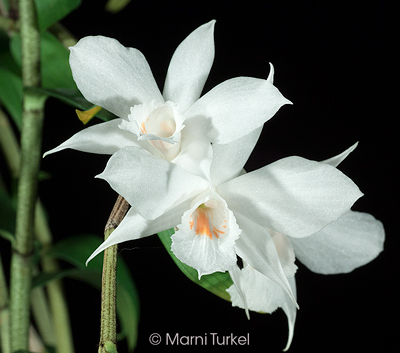 The Species: Found in forest as an epiphyte from China through Burma and northern Laos, this is a member of the nigro-hirsute (black haired) section of dendrobium and is noted for its long-lasting, 2" flowers. It blooms on leafless canes which will rebloom over a period of several years. It is found at elevations between 5000 and 8500 feet. The parent plants are from India. 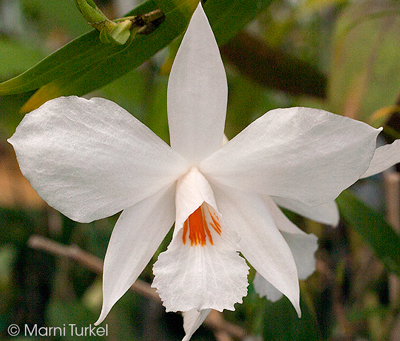 Culture: This plant benefits from a reduction in watering over the winter months. During the summer it is watered and fertilized frequently. It can be grown with intermediate to cool intermediate temperatures during the summer and cool to cold temperatures in the winter. My plants get winter minimum nights between 45 or 50° but have gone lower than that without damage. I have grown these staked up right and also mounted where they will be pendant.